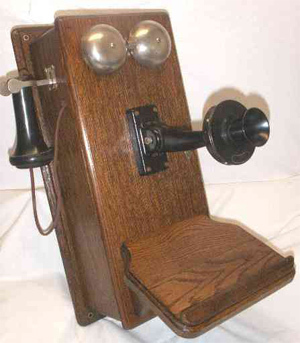 The model 317 magneto wall phones were introduced in 1907 and remained in production for about 30 years, a mainstay telephone for Western Electric. This particular example (which has been refinished) has a long cast iron transmitter arm with a black type 337 transmitter and unmarked cup. It has a powerful 48A 5-Bar magneto, and original Bi-Polar non-terminal receiver with cap marked "PROPERTY OF THE AMERICAN BELL TELEPHONE COMPANY" on the side of it. The original mouthpiece has a star in the center. The bells ring vigorously when the magento is cranked. It has the original schematic on the inside of the door, and the original directory hanger hook on the right hand side.